DJ Shadow has unveiled the music video for the song “Nobody Speak” featuring Run The Jewels, a standout track from his latest album ‘The Mountain Will Fall,’ out now on Mass Appeal Records. The video depicts a meeting of leaders that quickly descends into chaos, a scene not unlike what is unfolding in governments around the globe. 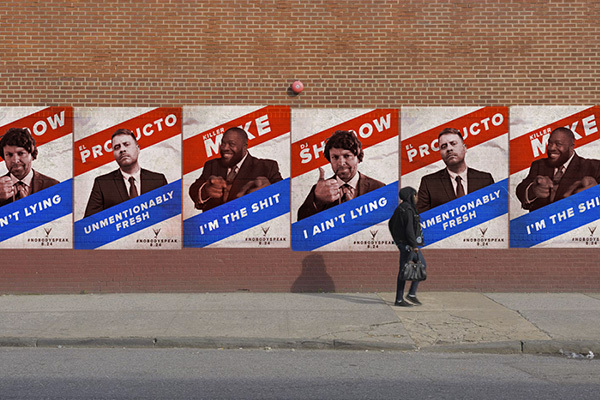 It also features cameos by DJ Shadow and Run The Jewels. Says DJ Shadow: “We wanted to make a positive, life-affirming video that captures politicians at their election-year best. We got this instead.” Says Run The Jewels’ Killer Mike: “It’s such a dope video. It’s what I really wish Trump and Hillary would just do and get it over with…And even in that fight I think Hillary would win – and that’s not an endorsement.” The video was directed by Sam Pilling and produced by Pulse Films, stars Igor Tsyshkevych and Ian Bailey, and was shot in NYC, London and Ukraine. Watch “Nobody Speak” below, and catch DJ Shadow at one of his upcoming dates! October 13 – 9:30 Club – Washington, D.C.